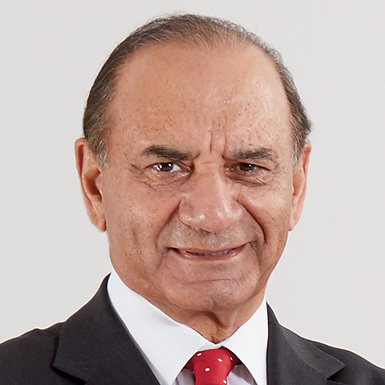 LEADERS Interview with Farooq Kathwari, Chairman, President and Chief Executive Officer, Ethan Allen Interiors Inc.
An Interview with Farooq Kathwari, Chairman, President and Chief Executive Officer, Ethan Allen Interiors Inc.
Farooq Kathwari has held his current post since 1988. He serves on the board of several nonprofit organizations. He is a director and past Chairman of the National Retail Federation, Chairman Emeritus of Refugees International, and a member of the Board of Overseers of the International Rescue Committee. From 2010 to 2014, he also served on the Presidential Advisory Commission on Asian- Americans and Pacific Islanders. Kathwari has received several honors, including recognition as an Outstanding American by choice by the United States Citizenship and Immigration Services and induction into the American Furniture Hall of Fame. He has also received the National Human Relations Award from the American Jewish Committee; the National Retail Federation gold medal; and Ernst & Young’s Entrepreneur Of The Year award. He was also named one of Worth magazine’s 50 Best CEOs in the United States. He received a B.A. in English Literature and Political Science from Kashmir University (Srinagar, Kashmir) and an M.B.A. in International Marketing from New York University. He holds three honorary doctorates. Ethan Allen Interiors Inc. (ethanallen.com) is a leading interior design company and manufacturer and retailer of quality home furnishings. The company offers free interior design service to its clients through the efforts of approximately 1,500 in-house interior designers and sells a full range of furniture products and decorative accessories through their website and a network of approximately 300 design centers in the United States and abroad. Ethan Allen owns and operates nine manufacturing facilities including six plants and one sawmill in the United States, plus a plant in Mexico and one in Honduras. Approximately 70 percent of its products are made in its North American plants. Will you talk about the culture of continuous improvement within Ethan Allen and what has been the secret to remaining so consistently strong? Reinvention is critical to any enterprise, even to an individual. Our success starts with understanding this. Naturally, we continually take steps to remain relevant. Most recently, we’ve been strategically focused on five areas that influence every aspect of our business: customer experience, diversity of style, consistent marketing messages, combining technology with personal service, and vertical integration. The general culture at Ethan Allen when I started was that if it’s not broken, don’t fix it. I said that the time to fix it is when it isn’t broken. I ended up hiring a journalist to work for us in getting the message across that we had to reinvent ourselves. We developed a monthly newsletter and a quarterly video news feed that helped create an atmosphere where people believed in reinvention. We had 30 manufacturing plants, mostly in the Appalachian Mountains from Maine to North Carolina. I held many town hall meetings in each of our operations during which I talked about the culture I wanted to build. We also started to have annual conferences at our Danbury headquarters, bringing in hundreds of associates from our manufacturing and retail networks. In addition, we had to create a culture that recognized that mistakes are part of life. We need to generally let people work and experiment, and even if they make mistakes, this is okay, as long as we are moving forward. When it comes to bringing in talent, how important is cultural fit and finding people who can mesh with that philosophy? We look for culture fit as well as skill level, but many years back I also felt that we had to establish certain common-sense principles as an organization. We came up with 10: Leadership – providing leadership by example; Change – understanding that change means opportunity and not to be afraid of it; Accessibility – being accessible and supportive, and recognizing the contributions of others; Speed – maintaining a competitive advantage by reacting quickly to new opportunities; Client Focus – our first responsibility is to our clients; Hard Work – establishing a standard of hard work and practicing it consistently; Excellence + Innovation – having a passion for excellence and innovation; Priorities – establishing priorities by clearly differentiating between the big issues and the small ones; Confidence – having the confidence to empower others to do their best; and Justice – always making decisions fairly. Over the past 15 years, I have asked our senior management to write an annual performance essay on how they have utilized these 10 principles during the past year. It’s interesting to read their reports, and most of them say these principles are not only very good for their work but also for how they conduct their lives. We’re always looking for talented people who share our passion for excellence and who want a rewarding career. Our global team is filled with talented people from all walks of life; they reflect the “melting pot” heritage of our country. Their unique points of view help make our brand special. We also have a culture of promoting from within. Many of our senior leaders have grown from position to position, allowing them to understand the needs and challenges of multiple parts of the business – it’s an experience that enhances their leadership abilities. Will you talk about how critical technology is as a differentiator for Ethan Allen? Technology is important. I recently held a webcast with 2,000 of our associates, most of them our interior designers. The topic, to a great degree, was the redefinition of personalized service. At one time, personal service took place when an individual interacted with a customer. Today, personal service also means utilizing technology. Technology and personal service are critical, even within our manufacturing. We are still making over 70 percent of our furniture in our own workshops, and most of that in the U.S. This would not be easy if we had not invested in technology to assist our craftspeople, helping to keep our quality standards high and letting us get our products to our clients’ homes faster than ever. In the past six years, general retail traffic in stores is down by 60 percent. We know that 70 to 80 percent of all shopping today starts on a computer, a tablet, or a phone. With consumers pressed for time, more and more people ‘window shop’ online for everything, and that includes home furnishings. We want to enhance our users’ experience on our website so they can find what they want quickly and easily, and they can get immediate assistance if they need it. Over 100 of our interior designers have now been trained in live chat with our customers, so although our store traffic is down, it’s only down by about 20 percent. Technology and personal service are clearly important advantages for us. How do you make sure that the human contact isn’t lost by the technology? We are in the business of providing not only great products but also the service of interior design. Professional interior designers provide that service, so technology’s role is to help them. For instance, a few years back, we gave every interior designer a tablet that is connected to our computer systems – they can operate it at home and in the design centers. It gives them the opportunity to work and have information. In our design centers, we have put in touch-screen technology. This is great in and of itself, but when we add the personal touch of professionals, it differentiates us. Good personal service is the new luxury, but technology plays a very important role in providing that service. Is brick-and-mortar still as important today as online shopping continues to grow? Over the past 10 years, we have relocated many of our stores into smaller locations, and into what might be called lifestyle centers where people tend to shop. We have also converted the stores to design centers or studios, which is really a professional studio for interior designers to work with clients. People still want to touch and feel our products, but brick-and-mortar functions differently than it did even 10 years back. It has to be something that will help with personal service and technology. It can’t be just a place where people are going to come and shop. That kind of concept is becoming difficult to maintain. How important is it for you to continue to build the awareness for what Ethan Allen is today? Brand recognition is important, but more important is that it stands for something desirable. We are known for our good quality and service. However, we still have a lot of work to do in terms of getting the message across that Ethan Allen is in the business of providing great interior design service, and that is where our focus is. How important is it that the diversity of your customer base is mirrored within the workforce? We have a very diverse customer base and workforce. Most of our management team is female – not because we were looking for women but because they were the most qualified. When we started to run our retail stores, the question was: Who will run them? We came to the conclusion that the best person to run anything is the person with the greatest passion for it. Interior designers have a passion for providing their service so, over the past 15-plus years, we have trained more than 200 very strong leaders who have come from interior design. They had the design sense and now have the business sense. In terms of diversity in our workforce, it reflects our management and our people, be it in retail or manufacturing, as well as our customer base. We recently held our annual designer conference where we recognize 250 of our top interior designers. For the past few years, many of the top designers in North America have been of East Asian origin. For young people interested in a design career, what are the ingredients and the characteristics needed to make an effective interior designer? Our business model, especially for interior designers, is that they have to be entrepreneurial and disciplined. I still review and approve every interior designer that joins the company’s retail division. Today, almost 80 percent of the folks coming in and joining us ran their own interior design businesses as entrepreneurs – and we need entrepreneurs, especially now that we’re talking about providing great personal service and technology. In our new IDEAL program (Interior Designers with an Entrepreneurial Attitude and Lifestyle), our designers are working with clients at all hours, sometimes at midnight, sometimes early in the morning, so entrepreneurial attitude is very important. Our entire business model, be it in manufacturing, retailing, or logistics, is based on creating an entrepreneurial and disciplined environment, which is important because they all represent our brand. We recently launched an important program – a collaboration with Disney. It’s a great meeting of two brands. We have developed great products and are projecting them under the umbrella of the Ethan Allen | Disney magical home collection in our design centers. Are you still making the best quality product in America and how important is it that an emphasis remain on America producing that type of quality? Americans can produce great quality, but they have to be given an opportunity. If the only objective is the lowest possible cost, it’s hard to do that. In the U.S., we have manufacturing spaces in Vermont, New Jersey, and North Carolina, and we have three major workshops with almost one million square feet each where we make our sofas and chairs. Fifteen years ago, globalization and commoditization hit our industry like a tsunami. Most of our competition took their manufacturing offshore because of the cost and also because they couldn’t find labor to do cutting and sewing – so it was almost a lost art. We could have gone out of upholstery manufacturing, but fortunately nine years ago, we had an opportunity to acquire a small plant in Central Mexico. A former American Air Force officer and his family were running it. I saw how they treated the workforce with dignity so we decided to acquire it. Today, it’s close to 700,000 square feet and employs 1,000 people. They do our cutting and sewing and ship that product to North Carolina. We are now able to ship some of our custom upholstered product to North America in less than 30 days. However, this would not have been possible if we didn’t utilize the great craftspeople we have in the U.S. who do most of the upholstery from the cut and sewn fabric from our Mexico operations. When we went to Mexico, we decided to set up similar environmental and safety standards to those we have in the U.S. The results are good quality and low turnover, because it’s clear that people all over the world want to be treated with dignity. We are pleased with our standards of social responsibility, as that also merges well with Disney’s focus on social responsibility. Combining our talent in Mexico and North Carolina gives us an opportunity to use American craftsmanship. Without that, we would have lost a lot of labor in America. Are you able to take time during the process to appreciate the wins or are you always off to the next thing? We have to do both. We have to celebrate and recognize the work that our associates do. I do think of it, but I’m also constantly thinking of the next step. What are the key ingredients today to being a successful CEO? First, I would refer to our Leadership Principles. From the early days, the characteristics of leadership have remained constant. A leader must have knowledge and gain knowledge from others. Leaders are also known by the advisers they keep. Corrupt advisers will lead someone to corruption. If they are dishonest, they will lead someone to dishonesty. A leader also needs courage to stand up for what is right, which isn’t easy. Last year, we had an activist who wanted us to sell all of our real estate. Our board of directors had the courage to back us and fight it. We spoke with the stockholders ourselves, and they agreed with us. Just a year later, we had our annual meeting of shareholders where about 95 percent of our shareholders voted, and all of our proposals were approved by over 98 percent of the votes. Most important, a leader needs wisdom. When we look at national and business leaders, having knowledge, courage, and wisdom are important characteristics. Do you feel leadership traits can be taught or must someone be born with them? Click Here to Download a PDF of An Interview with Farooq Kathwari, Chairman, President and Chief Executive Officer, Ethan Allen Interiors Inc.